Image courtesy of Library of Congress Representative Oakes Ames of Massachusetts served five terms in the House of Representatives. On this date, the New York Sun exposed the Crédit Mobilier scandal. Crédit Mobilier was a sham construction company chartered to build the Union Pacific Railroad by financing it with unmarketable bonds. It also provided a mechanism to dispense the immense profits from building the railroad to the board of directors and its shareholders. 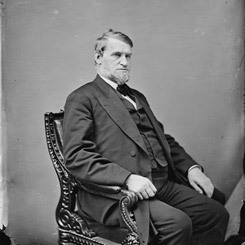 A few years earlier, one of the chief participants, Representative Oakes Ames of Massachusetts, had sold shares at bargain rates to roughly a dozen high-ranking House colleagues, including Schuyler Colfax, then-Speaker of the House (who, by 1872, was the sitting Vice President), in order to secure political clout to benefit the company. Most of the Members got rid of their stock quickly, nullifying the large returns they could have received. However, Representative James Brooks of New York (who also a government director for the Union Pacific) profited from a large block of shares. When the scandal became public, Speaker James Blaine of Maine appointed a select investigation committee chaired by Representative Luke Poland of Vermont in December 1872. Speaker Blaine noted that “A charge of bribery of members is the gravest that can be made in a legislative body. It seems to me . . . that this charge demands prompt, thorough, and impartial investigation.” On February 27, 1873, the House censured Ames and Brooks for using their political influence for personal financial gain. A compilation of scholarly analyses of the House Speakership, both its development and the individuals who have shaped it.